We recently had a customer come to us wanting their chandelier cleaned; this however wasn’t a small job (I was about the same height maybe slightly shorter than the chandelier and I’m 5ft 7!). Therefore, this meant that we would have to take the basket chandelier down – this is how cleaning is normally done to insure that the chandelier is left properly sparkling – but in this case it proved much more difficult because of the positioning of the fixture and its size. We never shy aw ay for a challenge however, and enjoy the process of making the chandelier shine again and seeing how much it sparkles when it has been returned to its former glory afterwards. Due to the chandelier being a basket chandelier, the design meant that there are many different layers of crystals and different aspects that make up the chandelier. No time can be specified to say how long it is going to take to clean. The process can be lengthy and will obviously change depending on the size and design of the fixture. 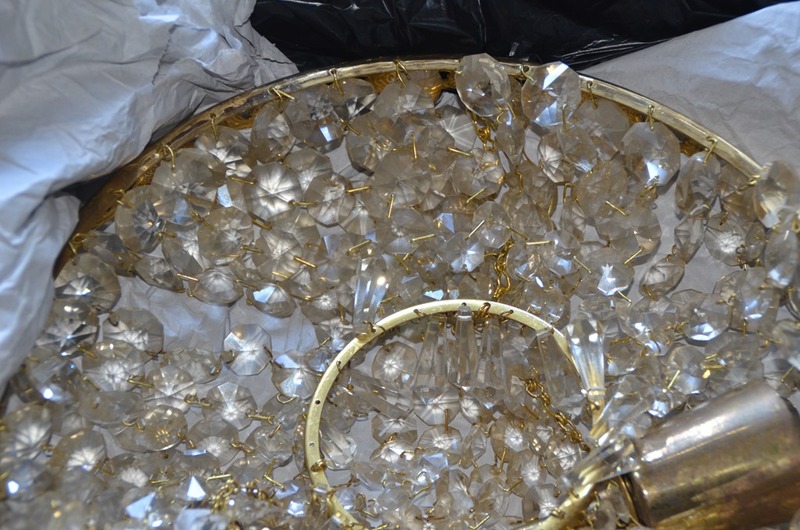 Each crystal chain has to be removed, soaked, scrubbed and dried off to ensure it is really shining! 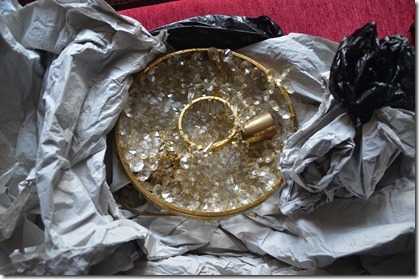 The components are then used to put the chandelier back together and return it to its wholeness. 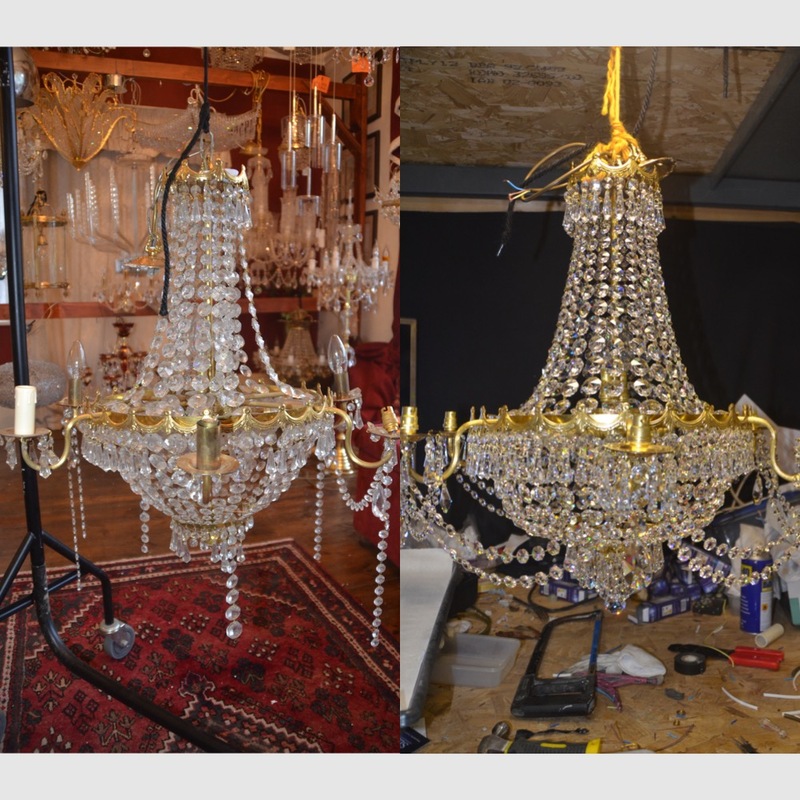 In this case, all of the different components of the chandelier had to be packed up so that it could be reinstalled back in the owner’s house. Sometimes the chandelier can be put back together without having to be in the vicinity, but due to the size and design of this chandelier it wasn’t possible. This meant a trip to the customer’s house to put it back up. 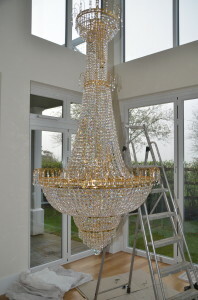 We didn’t mind this though as it meant getting to see the chandelier back into its home and to take pictures to show you of course! h means that the fixture can be dropped down to a suitable height for cleaning and bulb changing without causing too much inconvenience. Winches are especially beneficial for those that have high ceilings, the winch will bring the light fitting down to a manageable and suitable height where the fixture can be maintained and properly looked after! Winches are supplied with either a remote or a wall switch for your convenience. In the customer’s house, the position of the chandelier means that now it is clean, it is so eye-catching to see and is arguably emphasised because of the windows surrounding the room it is hung in. The windows let in natural light which further a dds to the sparkle! They are over 2 floors which helps there to be sparkle at all and any time of the day because the light shines in from above or to the side ensuring the basket chandelier always looks its best! If you like the design of the Basket Chandelier, we have a range on the website so please feel free to look, get ideas or even get in touch if you want more information about basket chandeliers or even cleaning. 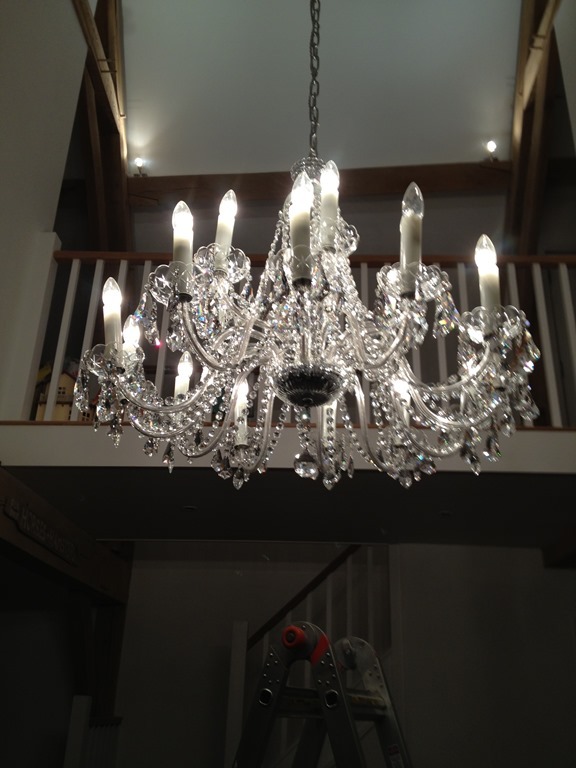 Chandelier cleaning jobs are rewarding, satisfying and always leave our customers happy because they can see their chandeliers returned to their former glory adding sparkle, status and glamour to any room. If you have a chandelier which you can’t access to clean, or even a chandelier that you don’t know how to clean, we are more than happy to take that off your hands and get to work leaving you with a brand new looking chandelier. It is becoming more common to purchase pre-loved chandeliers, or in other terms second hand chandeliers. For some it might be because it is cheaper, for others the fact that the chandelier is pre-loved means that there might be an additional vintage factor added to the already vintage style chandelier. Whatever the reason, we think you can’t go wrong with buying a chandelier whether or not it’s second or first hand. 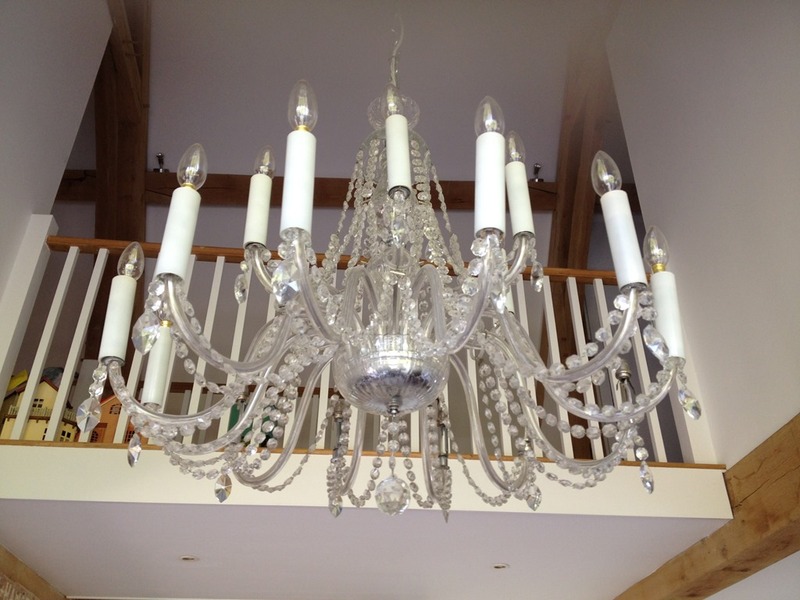 However, there are some things that you would be wise to look out for when buying a second hand chandelier. O n listings online it isn’t uncommon for people to be misled and therefore misleading you or for them to say something about a chandelier that they don’t actually know to be true. 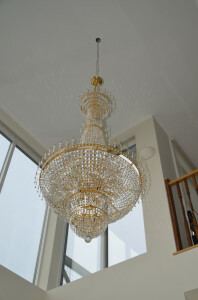 For example, on a recent listing we viewed, the chandelier was described as having 40% lead crystals. This is a very uncommon lead percentage to find in crystal trimmings as the maximum used is 35%. Most commonly the usual percentage lead crystal trimmings is 31%. It is always said that 31% or less is the percentage used in crystal trimmings, so if there is any more lead percentage than this in a crystal, you can be assured that this wouldn’t have been manufactured from a reliable manufacturer. Crystal chandeliers especially can be a cause for sellers claiming the crystals on chandeliers are better quality than they may be or are different crystals than they state. 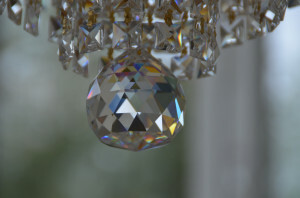 It is most common when it comes to Swarovski crystal; this type of crystal has become a popular make of crystals and is very well established. 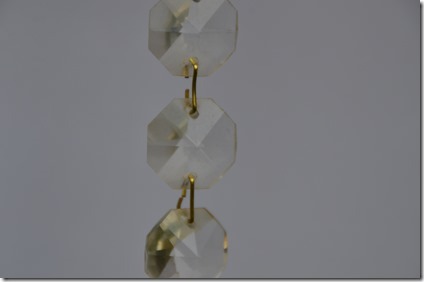 Being able to distinguish different types of crystal and the quality of all of them is far from easy! You have to have a good eye for it, or know what the different crystals look like. For bad quality crystals, there would be no light refraction or clarity within the crystal. You can usually tell this just by looking at a picture of the crystals (obviously depending on the quality of the picture). Another es sential thing to look out for in the listings is spelling mistakes; if a seller has listed their product with spelling mistakes they clear don’t know what they’re talking about. A recent listing we have seen has written “Moreno” instead of Murano glass. 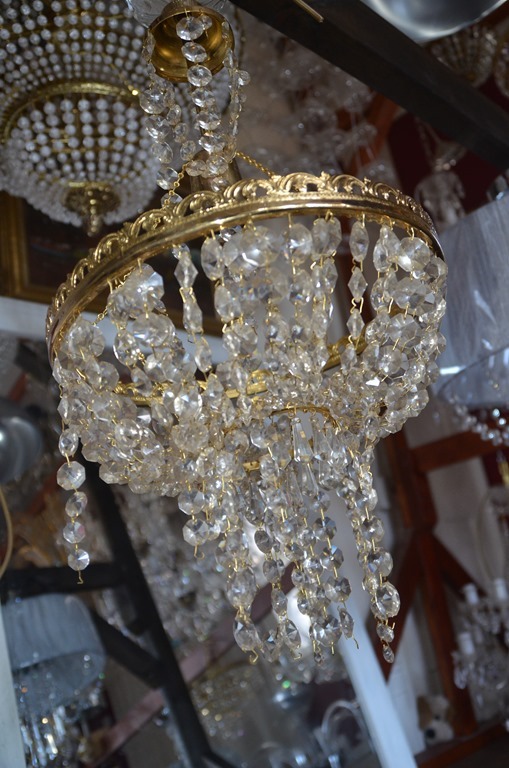 This to begin with is bad, but after looking at the photo and seeing that the chandelier being sold was actually colourless proved that the light definitely wasn’t Murano! 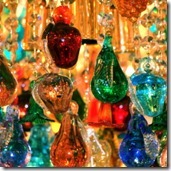 Murano glass chandeliers usually come in a variety of different colours and patterns. 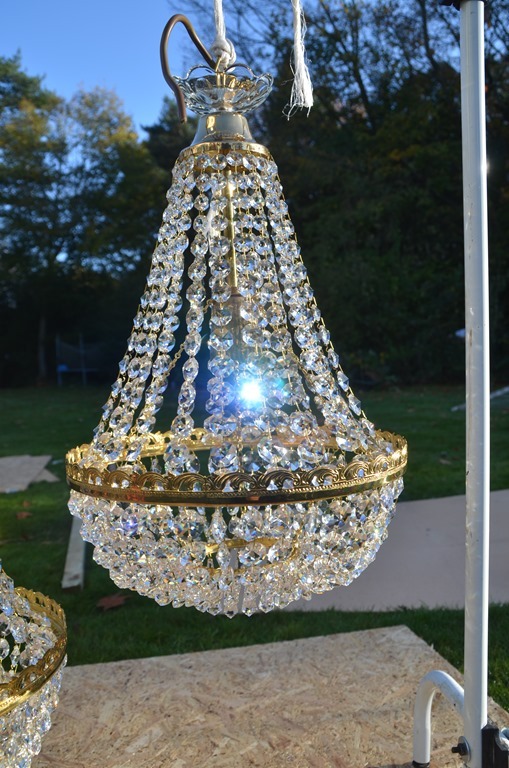 The make of a chandelier that a seller was also selling was also spelt wrong; it wasn’t that it was a genuine typo and it has been missed in proof reading, the spelling throughout was incorrect. In these situations it definitely doesn’t build your confidence! When reading a listing, it is important that you feel like the seller knows what they are talking about, if you don’t feel comfortable, don’t buy it! 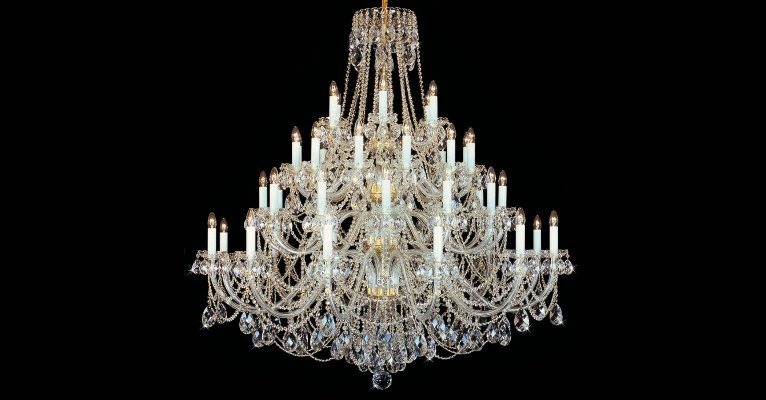 The more information in the listing, the better; listings where for the diameter and size of the chandelier is stated is a good start, firstly for you as the prospective buyer because you calculate the size of the chandelier and the size you need, but it also shows that the seller has ensued you have this information, which shows some sense of reliability. There have been some listings I have seen where all you have is a picture and one line describing what your own eyes can already see in the picture! Overall, we advise that you don’t buy second hand chandeliers! While they can look nice in pictures and seem like they are from a reliable source, you don’t actually know. Knowledge is power as the saying says, especially in this circumstance. 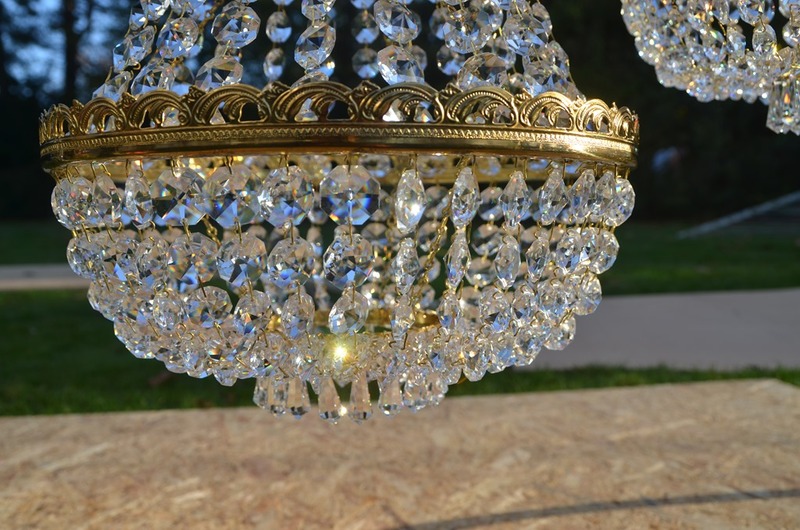 As well as second hand chandeliers, you might have an old chandelier that is looking a bit worse for wear or has been hidden away for some time – these situations we get phone calls about on a regular basis. As I’ve written this, we have had someone ring in saying that they’ve found a chandelier in a drawer and want to see how it could be restored and if the colour of its finish could change. This is all entirely possible! 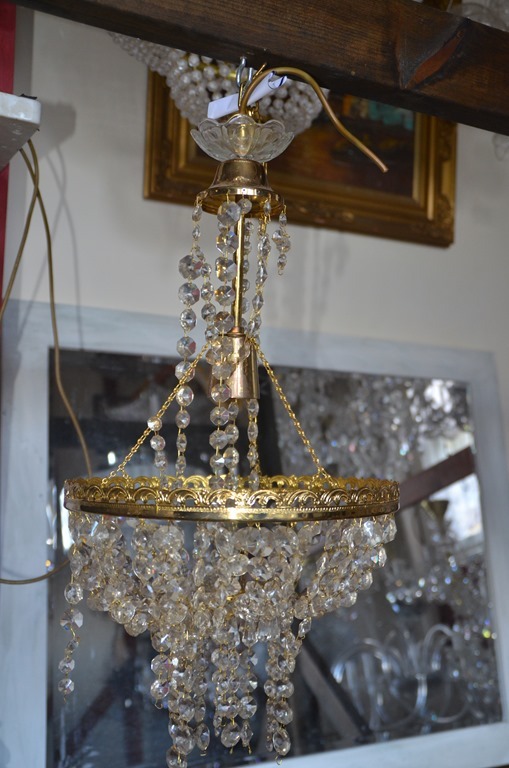 At the end of the day, you don ’t know until you ask but we are always available to talk to you, advise you and look at your chandelier to give an opinion on how it can be restored. We love chandeliers and love being part of the process of getting them back to their former glory! An example of some of the previous restorations we have done is on our website, please click here to see and read more! Feel free to also give us a phone call on 01420 520521 for advice or you can also email us for any questions you might have. 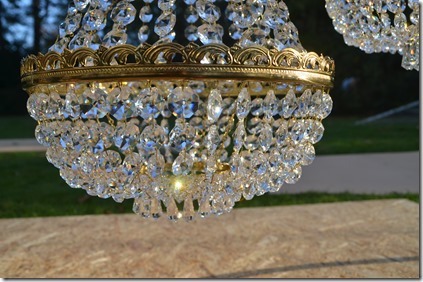 (Above) – Before and After pictures of a Chandelier we cleaned and restored. For more info follow the link above. National Trust parks and houses are a treasure to all who live in the UK; the opportunity to be able to step back in time, see and walk the grounds that used to be owned and how the interior of houses used to be decorated is fascinating and refreshing. Chandeliers can come in all shapes and sizes, but authentic, classical chandeliers are the most popular; and after seeing so many in all of these stately homes can you blame anyone!? We have recently had the pleasure of doing work in Hinwick House, click here to read in more detail about the different work that we did within the house. The chandeliers were grand and there were multiple lights to change and fix! It was a challenge but equally as exciting. We loved being a part of helping restore the lighting to its former glory. It is undeniable that lighting has definitely come a long way, but also undeniable that we still want it go back the other way due to the design’s that are constantly recreating lighting from the past. The authentic look of a chandelier is definitely a desired one! So many people strive to have authentic looking lighting in their homes. From the 15th century onwards, chandeliers used to symbolize status and power when hung and shown in stately homes; it was the symbol of money and lives of luxury. 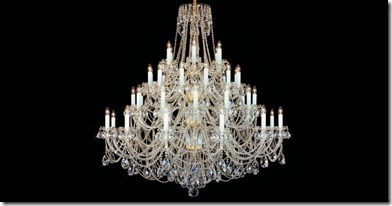 While this isn’t necessarily the connotations that chandeliers have nowadays, they still emulate a feeling of grandeur. This, it can be argued, is because of their timeless designs. Their designs have been carried over through the centuries to continue fanning our desire to ultimately make our homes more luxurious. is even more evidence, which points towards the striving desire to have chandeliers looking the way they used to. There hasn’t always been electricity, and before the times of gas and electricity, chandeliers used to be lit with candles. The mid 19th to 20th century is when this all started to change and the revolution of gas and electricity was seen on the horizon. At this time, a lot of lights were converted so that they could bend with the times and be used with gas or electricity. This is seen in a lot of the National Trust houses today where original fixtures have been adapted so that they will work with electricity. However having chandeliers which work with electricity isn’t always easy which has been proved in a recent news article. 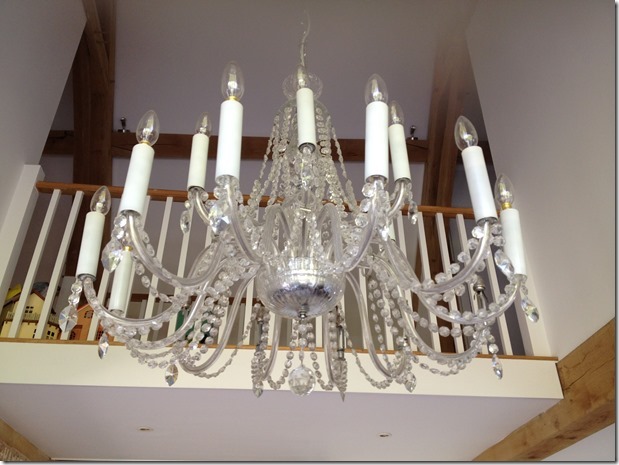 There has been a story about a chandelier work job that went wrong! Ever seen the sketch Only Fools and Horses? If you have, you’ll understand why this has made the news! 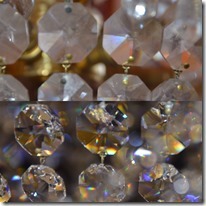 emphasizes the importance of being how fragile chandeliers are and how essential is it that they are well looked after. To read more on the story follow this link: http://www.dailymail.co.uk/news/article-2583281/You-plonkers-Bungling-workmen-accidentally-recreate-scene-Only-Fools-And-Horses-dropping-stately-homes-historic-CHANDELIER.html. Chandeliers are fragile and priceless. This is shown through their copious adaptations they have endured throughout history, but also through their timeless designs. It is very important to ensure they are cleaned and maintained regularly to ensure they can go on being priceless. We at Classical Chandeliers offer a cleaning service for chandeliers which might be in a bad position to clean, or are just of a tricky design to clean, or just in need of a good clean and you might not know where to even begin! 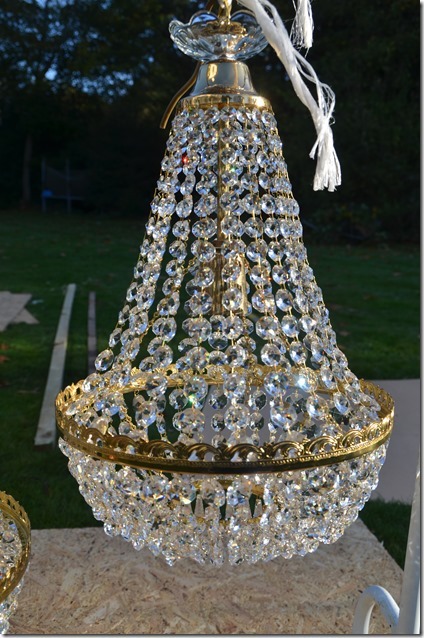 We will have your chandelier looking as good as new and sparkling like you’ve never before seen! 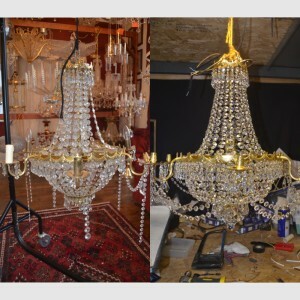 As well as a cleaning service, alongside that we offer a restoration service; maybe you’ve read this article and are feeling inspired and want to restore and clean an old chandelier that you inherited but wouldn’t know how to get it working again, we can help! As seen on our website, we have a section dedication to discussing the different restorations we have previously done. So, if you are looking for a restoration or cleaning, please do get in touch! 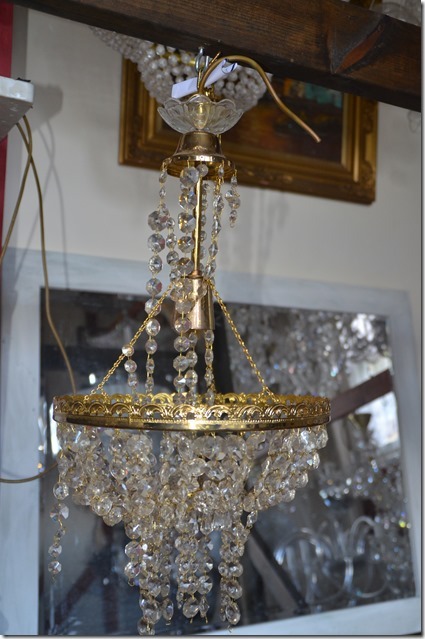 This video shows the end result after the cleaning and restoration of a chandelier. It really shows the dramatic transformation that is possible from taking what appears to be a light which looks to be beyond repair and restoring to an amazing level of beauty. Seeing is believing. When you are taking chandeliers down please make sure you know how to do this as any movement may cause damage. The same applies for packing and will save you money on restoration in the future. The two baskets chandeliers brought to us were lovingly wrapped in paper, unfortunately flat packing for long term storage caused great deal of damage. The crystal chains were on top of each other and the connectors have interlocked. When these chandeliers were eventually unpacked the interlocked chains have dislodged under pressure and chains came to pieces. Chandeliers such as these should have been suspended in a box or all the crystal chains should have been taken off the frame and wrapped individually in a tissue paper. These chandeliers were not cleaned prior to storage and although not very dirty had evident nicotine staining. To restore these chandeliers I had to take all the chains off and establish how many heads should be in each row and how many heads in which size. It is crucial that all sizes and numbers are exact as any deviation would result in deformations of patterns and therefore devaluation of the chandeliers. After hours of painstaking rearrangement of crystals the crystal chains were finally ready for washing and polishing. And this is put back together. These chandeliers are probably 30 years old, but as they are of a high quality come up like new. This chandelier was purchased on ebay and was missing all dishes, the dish trimmings and most importantly half of the dish washers, which means that the dish would slide freely all the way on the glass arm. To add the dish washers is not an easy task as the lamp holders have to be disconnected, taken off completely, only then the washer can be put on and the lamp holder reconnected again. This task was made harder by corrosion which made unscrewing the lamp holders without chemical help impossible. The next task was the reconfiguring of crystal chains as the length varied probably due to the connectors breaking. The quality connectors are made of brass which is the least corrosion effected metal in common use. Cheaper materials are only used to reduce the cost, unfortunately this is at the expense of life span as the corroded connector gives way and one starts collecting crystal chains off the floor now and then. I also had to squeeze in unplanned proper cleaning as the previous cleaning was done with spray cleaner which made the surface sticky and the dust just glued to all surfaces. Also the cleaning was not done as well as it could have been, the lower glass dish collected the fluid which then caused the metal cover to rust and left rust cake on the glass dish. The dish should have either been taken off prior to cleaning or emptied until it was no longer collecting any fluid. The other mistake was letting the fluid run inside the glass arms. There is no cure for this and simple clink film over the lamp holder would avoid unsightly dirt and sticky fluid residue display. All of this took me six hours and I still need another hour to make up all the trimmings for the top dishes as I didn’t have enough with me. But look at it now! What Size Chandelier Do I Need?